Is it me? Or are taxes too complicated and weird? This year’s tax filing continues the trend of obscure and mysterious tax situations that render the forms nearly incomprehensible. Take this small section, for example. 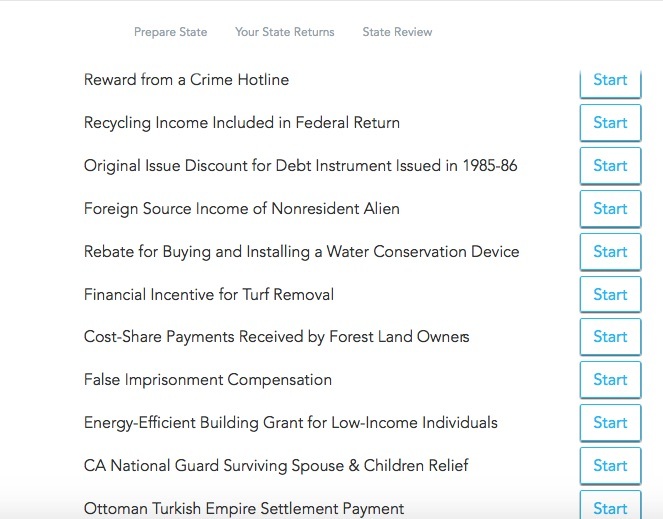 Here we have a snapshot from a page of the CA State details. You have to pay tax on rewards received from a crime hotline? Is recycling income bottles & cans related? What constitutes a water conservation device? Getting rid of your lawn will get you a tax discount? Oh, and my favorite. There are so many people who won their False Imprisonment lawsuits that they have to put the compensation received for it on the tax form? And what does the Ottoman Turkish Empire have to do with us and why are we settling financially with them? There are whole worlds of weirdness that affect us, and about which we know zippo. This entry was posted on Friday, March 13th, 2015 at 5:39 pm and is filed under Uncategorized. You can feed this entry. You can leave a response, or trackback from your own site. Omg, ottoman empire?? Holy shnikies! Yes they are complicated, that’s why people pay people like me to do them for them.